Negotiations between the Denver Classroom Teachers Association and Denver Public Schools will resume on Tuesday at 10 a.m. at the Denver Public Library following the first day of a teachers strike. 9NEWS will be at the negotiations as well as back on the picket line. We will provide updates Tuesday morning. Feb. 11 - 2:45 p.m.
We've received several questions from viewers about the Colorado pot tax money - part of the pitch to voters back when it was legalized was the money for education, after all. Viewers want to know why that money can't pay for what the teachers are asking. Short answer: because the Colorado pot tax money is just a drop in the bucket of the district's finances. The long answer: head to this link. Feb. 11 - 2 p.m.
Teachers are rallying at the state Capitol for higher pay after picketing most of the morning outside of various DPS campuses - East and South High among them. They're joined by U.S. Rep. Jason Crow (D-Aurora) who says he's proud to stand with teachers for higher pay. Feb. 11 - 1:50 p.m.
Denver Public Schools Chief Communications Officer Anna M. Alejo released a new round of statistics for the first day of the teachers strike. A spokesperson for the Colorado Education Association said that 3,769 teachers and support staff showed up for the strike on Monday. "More educators likely stayed out of school but were unable to come to participate in a pick due to child care needs, working a second job or other personal circumstances," Mike Wetzel with the Colorado Education Association said. 9NEWS has already put out an article explaining more about the "special service provides" - you can check that out here. Feb. 11 - 1:30 p.m. The central issue in the negotiations between the Denver Classroom Teachers Association and Denver Public Schools is the ProComp contract; that is why the teachers are striking. 9NEWS looked into what ProComp is, where it came from and why some teachers don't like it (saying it unnecessarily complicates their pay structure). At its core, ProComp is a pay-for-performance compensation system that has a list of 10 incentives. One teacher told 9NEWS they never knew what their salary actually was due to the ProComp provisions in her pay system. Funded by a mill levy tax increase, with a minimum of $25 million in taxes per year. Other districts have since adopted it. Incentive-based model with 10 different incentives. The expert 9NEWS spoke to said that there is some evidence to suggest ProComp actually improves student achievement overall. Denver teachers strike: What is ProComp (and why does it matter)? Feb. 11 - 12:45 p.m. The first day of the Denver teachers strike was the first day ditching class for one East High Student, who told 9NEWS reporter Allison Sylte that after seeing the schedule - decided classes wouldn't be worth it. "It was a waste of time," she said. "Everyone was mostly on their phones." The 10th grader's class schedule was hour-and-a-half chunks that included time for "College & Career" as well as "Exercise and Electives." Superintendent Susana Cordova spoke to the media at Emily Griffith Technical College in Denver about the status of DPS schools half a day into the strike. She repeated several times that she and her staff's main goal is to reach a deal. When confronted with a question about the union's demands about simple pay structure like their peers, Cordova said she couldn't agree more. The problem comes in over ProComp, which was a voter-approved funding measure for the district. Cordova said ProComp requires certain things related to pay and to walk away from it would cost the district $33 million. Voters in 2005 agreed to fund ProComp with a minimum additional $25 million in taxes per year. The two sides are close to a deal, Cordova said. She said is looking forward to the next round of negotiations set to begin on Tuesday. "We've worked as hard as we can," she said of the district. "Over the next two years, I'll be cutting $20 million out of the central office... It's really important work - it's the right work to do but it is really challenging..."
The goal of negotiations is to get to the middle - DPS has gone past the middle, she continued. Cordova said she toured close to a dozen schools on Monday and said she saw a wide range of situations at the schools, from calm and productive days to stranger days. When asked if some substitute teachers were "in over their head," Cordova said that at the schools she visited she didn't see anything like that. "Students are walking out, obviously," she claimed. 9NEWS has confirmed reports of high schoolers walking out of both East and South High School. While students have said they were told to leave, Cordova said it was the students' decisions to leave campus. "Inside [East High], it's very calm," she explained. "Very quiet, very orderly - not a lot of kids left so we understand that. The commotion started when the students decided to walk out." She went on to explain that the district's absence policy is still in place during the strike and any students missing classes to participate in the strike will receive an unexcused absence. Cordova was asked about federal education funding and worries the strike would take some of that money away from the district. The superintendent quashed those rumors, saying federal funding for the district is tied to a "count day" in October and therefore would be unaffected by the strike. Cordova was asked what she would do when the strike "becomes a problem", but she said the strike was already a problem. She said it was a problem for the kids in school not having their teachers in class and that she wants to get a new deal signed as soon as possible. Cordova was asked about the quality of the lessons students were receiving during the strike. She said obviously a substitute wouldn't be able to offer the same curriculum as the hired teacher that had been in the classroom since the school year began. Feb. 11 - 11:15 a.m.
Feb. 11 - 10:45 a.m.
We're getting more context surrounding the mess at East High School on Monday. A letter sent home to parents obtained by 9NEWS shots that students were not told to leave the school, but those who did weren't - at first - allowed reentry to the building. The school says most of the students walked out around 8:30 a.m. and that none were kicked out. Students who "have represented an interest in being in their classes have been included" back in school, according to the letter. 9NEWS reporter Allison Sylte is outside East High and spoke to a group of students during lunch who said they had no intention of going back into their classrooms after. Feb. 11 - 10:10 a.m.
9NEWS has received several reports from students and teachers at various Denver Public Schools around the city of "confusion" and students walking out. We've received videos from students at East High and an account (already in the blog) of a father who says it was pandemonium at Denver School of the Arts as students had nothing to do. According to 9NEWS reporter Jon Glasgow, parents have begun to pull their students out of Hamilton Middle School because "there was a lot of confusion and the students are being put together in very large groups". Other parents have reached out to say "no learning" is going on in their children's classrooms. We are working to learn more. Three freshmen at East High spoke to 9NEWS reporter Liz Kotalik about how they expected "more organization." "They were all corralled into the gym and were handed these schedules, until the school ran out of them," Kotalik said over Twitter. "Some students went to first class, others stayed in the gym... An announcement on the intercom, that students claim was hard to hear, essentially said if you want to walk out, now's the time." She said one student was planning on staying the whole day but decided, "what's the point?" A district spokesperson told 9NEWS things were organized inside the school. Feb. 11 - 9:30 a.m.
A large group has gathered at West High School and the Denver Police Department has officers blocking off a stretch of 11th Avenue for the strikers. Follow Allison Sylte for more live updates on the strike over Twitter. "This morning I attempted to reach you regarding the dangerous situation at Denver School of the Arts for my daughter [redacted]. She elected to attend this morning as she had a college class taught by a CCD professor thinking that she would receive instruction. Instead she was herded into the library with all of the other juniors where chaos reigned. There was no instruction and it quickly became bedlam. If you cannot provide a safe environment for our students then it is your dury to shut the school down. "I called the school to speak to you about this but after waiting 45 minutes on hold, I was told you could not take my call. This is unacceptable; you ahve an unsafe situation at the school and you refuse to talk to parents about it or take the necessary action which is to shut down school down." Feb. 11 - 9:15 a.m.
Feb. 11 - 9 a.m.
Feb. 11 - 8:50 a.m. Some schools held classrooms in auditoriums because they were so understaffed. While Superintendent Cordova stressed that won't be the norm in Denver, at least two schools - Brown International Academy and Hamilton Middle School - are holding classes in its auditorium, gymnasium, cafeterias and hallways. Brown International Academy is in northwest Denver and has classes from preschool up to fifth grade. Hamilton Middle School is in southeast Denver. Feb. 11 - 8:20 a.m. According to district spokesperson Will Jones, as of 8:15 a.m., 2,169 teachers have walked off the job. Teachers are striking over the way the district's compensation money is spent - the district has offered to put millions into incentives, but teachers are demanding that money be used to beef up the district's base pay model for teachers. Feb. 11 - 8:10 a.m.
Sign roundup! Below you'll see a collection of various signs from the teachers strike. We'll do this throughout the day. Feb. 11 - 8 a.m. Dozens of teachers are picketing outside of Hamilton Middle School, chanting things like "we can't stay without fair pay" and "we're not going to take it anymore." Feb. 11 - 7:35 a.m.
For parents looking for some activities for their children in Denver, the Denver Public Library announced that all of its locations will open at 10 a.m. for the duration of the strike and provide "active and passive programs to keep students engaged." Feb. 11 - 7:25 a.m.
Find more information by-the-numbers at this link. Feb. 11 - 7 a.m.
During a short briefing, the union said it was a "good day" to stand up for students. They also said the strike was their last tool to get the district to listen. Feb. 11 - 6:40 a.m. The union was set to give a press conference at South High School but were told they could not be on the property. It's unclear now when the union might provide an update. Feb. 11 - 6 a.m.
Feb. 11 - 5 a.m.
Teachers are expected to strike Monday morning and Denver Public Schools is preparing as best it can. The district will bring in over 1,000 substitutes and administrative staff to make up for the teacher shortage. District leaders returned to a half-empty bargaining table Sunday morning at 9:30, despite being told by the teachers union that they won't negotiate again until Tuesday - at least a day after the teachers strike is in full swing. "I think it's really unfortunate that the union is preparing to strike," said district Superintendent Susana Cordova during a Sunday morning appearance on 9NEWS. "We're ready today to continue negotiating." Almost 3,000 of the district's 4,300 teachers are a part of DCTA. 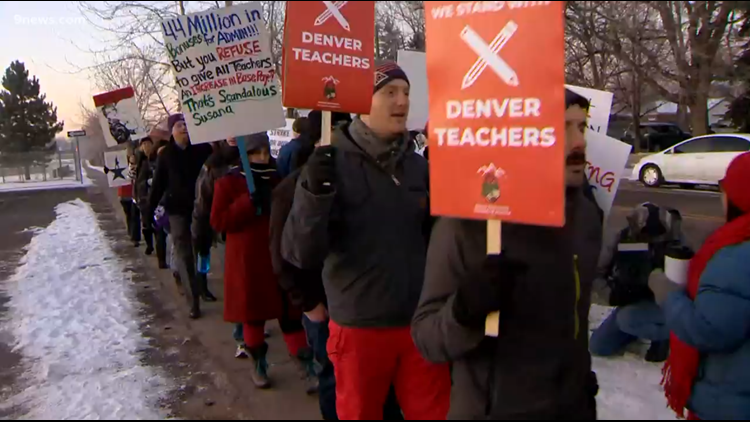 Some of the picket lines are expected to be outside of prominent Denver schools, including East and South High School. The district's 92,000 students will be taught by substitutes and administration staff brought in to help. Cordova is adamant students will still learn, but was clear that Monday would not be a "normal" day. Teachers picket in front of South High School on Monday, February 11, 2019.